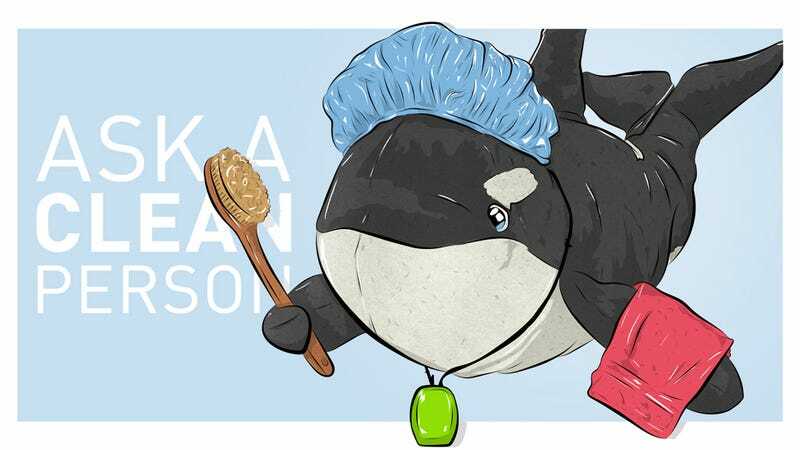 Let's say I have a friend who has a stuffed whale named Tide that is black with a white tummy. However, instead of being white, Tide's tummy is now grey with schmutz; what's the best way to restore her to gleaming white without fading her black markings? Topical bleach pen? Soaking in OxiClean? Also, do you know about *drying* stuffed animals so that their fur does not get matted? Air drying and brushing? These things are of great concern. Thanks for your help! These things are of great concern—I completely agree! Also, Tide sounds like a lovely companion. While most plush animals can safely take a spin in the washing machine, in general I recommend hand washing, because it's a gentler approach to bath time for these beloved sidekicks. I mention that both approaches are an option especially for the parents out there who read the words "hand washing" and were immediately filled with dread at the thought of adding that task to their chore list. If you opt for machine washing, use the gentlest cycle available to you, and either cold or warm water and a mild detergent. If your stuffed friend is of a size and shape that makes it possible, putting him or her into one of those launderable mesh bags is also a good idea, in that it will help to protect its parts. Including a towel or three in the wash is also a good way to protect precious cargo. Similarly, machine drying is an option, though not the best one. If you do choose to go that route, use a low- or no-heat setting. In terms of your products, a small amount of mild laundry detergent or even a gentle shampoo like Johnson & Johnson's Baby Shampoo, coupled with a laundry booster like OxiClean or Borax, will be just fine. No need to detail poor Tide's tummy with a bleach pen. Also, when I say "a small amount," I really mean a small amount. A teaspoon of detergent and a tablespoon of Oxi or Borax will do it. It has been some time since I last took you through basic hand washing instructions, so let's do that now as a refresher. It bears repeating! For my money, the kitchen sink is the best spot for hand washing operations. If you are going to use the sink, clean it first. If the kitchen sink isn't the best place for you to do this, go with the bathtub, the bathroom sink, or any sort of bucket-type situation that is roomy enough to submerge the item in need of cleaning in water, and also allow space for your hands to get in there without sloshing a huge mess everywhere. Fill the sink, or whatever vessel you're using, with water and detergent. Water temperature, the type and amount of detergent, and any extras like OxiClean should be tailored to the item being washed. Wool, bras (hey, ladies read Deadspin too! ), linen—those are all things that should be washed with cold water, but for the most part, warm water is ideal for hand washing purposes. If you're washing with cold water and are using any powdered products, dissolve those in a cup of warm or hot water, and add that solution to the mix—often, those kinds of products won't dissolve entirely in cold water. Almost always, you will use too much detergent. Do your best to break that habit. I know it's difficult, no snark. Introduce the item in need of cleaning to its bath. Using a kind of CPR chest-pumping motion, press up and down on the item so that it becomes fully submerged in and saturated with the detergent solution. Then let it hang out and enjoy its swim for 10-60 minutes, with 15-30 minutes as a default. The amount of soaking time needed depends on the nature of what's being cleaned; dingier items should soak longer, while temperamental fabrics (like silk) should soak for shorter periods. In the case of Tide, let her enjoy a good hour of swimming—it will probably bring back nice memories of her homeland. Errr, homesea? Once the long soak is complete, give the item one more pressing while submerged, then drain that disgusting wash water. And oh, will it ever be disgusting! It will also be grossly satisfying, so you should look forward to that. If there's a ring-around-the-sink/tub/bucket, wipe that up before we get into the rinse cycle. Then, replug the sink, fill it with clean water, and give your stuffed animal—or scarf, or brassiere, or whatever it is that you're washing by hand—a few more of those CPR pumps to help release the soap 'n' junk. I vastly prefer this approach to rinsing, because it's gentler than the force of running water, which is what most people probably use for rinsing, i.e., holding the item under the tap. Sturdier items will be fine under the tap, but don't force water through more delicate items, okay? Okay! While it's still in the sink/tub/bucket, press down gently to extrude as much water as possible from whatever's been washed. Avoid twisting it to wring out water, as the twisting motion can be rough on fibers. Transfer the item to a clean towel and roll it up, pressing again to extract more water. Then lay the item flat to dry. If what you're washing is something like a stuffed animal, it might look a bit matted after air drying—turn a hair dryer on to its lowest setting to fluff the fibers back up. This will work best on something slightly damp, so if it'd dried completely go ahead and spritz it with a small amount of water. Now then, those instructions may give you the impression that hand washing is an ordeal to be avoided at all costs. That would be incorrect! I just like to be thorough when I write stuff out for you, but don't let the length throw you: This is a pretty painless endeavor. You may also have the impression that I picked a question tangentially related to sleep habits so I would have an excuse to ask how your bed-making is going. That would be correct! So, how's it going? Also, please tell me about your grungy and beloved stuffed animals.